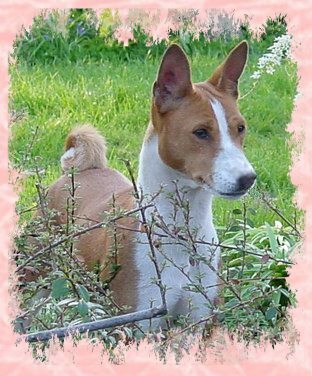 The Basenji is a dog requiring commitment of an owner. It’s alert, very intelligent and independent. This short-haired dog has no bark but is able to produce plenty of other sounds that may make the owner (and neighbors) wish it did bark. Easily bored they will find their own entertain to the owners displeasure. Not unlike a goat they will eat and chow on just about anything. They love freedom and the “hunt” and should not be left off leash unless securely confined in a fenced yard or enclosure. Plenty of exercise. Basenjis love to be a part of the family. 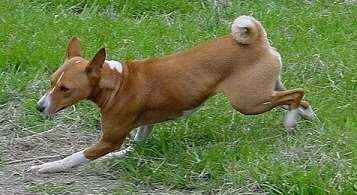 They can get along with other dogs and cats (keep a close eye on them until they adjust). Don’t, however, intend to raise rabbits or other small mammals that may rekindle their hunting instincts. Soft Very clean dogs – groom themselves. Barkless. Escape artist. Needs human contact and exercise.